The "Take It!" 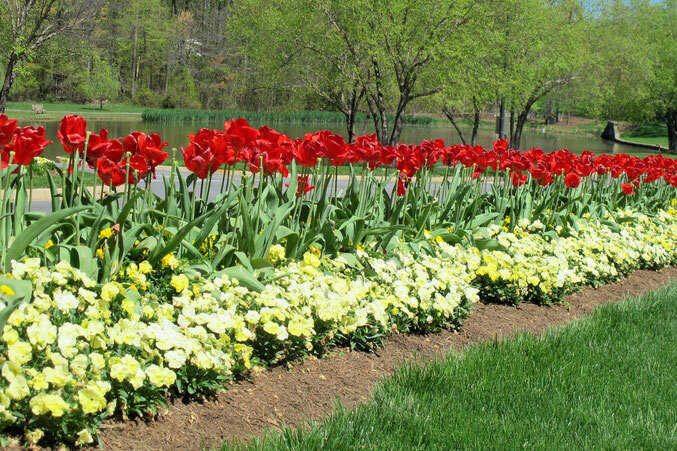 came from having passed by this ever so well groomed median and its planting of tulips in full bloom at what seemed to be just the peak of their splendor. The contrast with the pansies is just grand from a color perspective along with layout. There is a small man made lake in the background that many times has people walking next to it or sitting on some of the benches that are provided. This was one of those "stop the car" moments, I had been lulled into having it just be a part of what is a well manicured site in my run of locations visited. The After Take: As I write this it occurs to me that I have never seen any runners in this area. Perhaps it is just the near mid day time I occasion by it. This being noted, the entire setting seems to influence the pace of everyone that I have encountered there. More relaxed would be a fitting description, a welcome contrast to many of the other locations I encounter during my day. While this might easily qualify for the flowers section of this site, I could not help but include it as it was another outside visual treat in my journey that calls for a different kind of sharing. Here is hoping you have had some tulips with all their colors and even different shapes this spring as a part of your life. Thanks for joining us for the current photo presentation. You are cordially invited to return Friday, May 4th for a new picture that we hope you will enjoy. P.S. We would like to apologize for missing a picture last Friday. We had a technical issue we had to handle. We appreciate your patience. Looks like a really nice spot for a date. Ya that is quite a view. I imagine this one would drive the ladies nuts! Thank you for the love folks. We appreciate it! Wonderful contrast of brave red tulips and the frilliness of the pansies. The newly green trees and the water nearby compliment the scene. Beautiful!